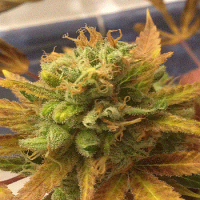 Harlox Regular Marijuana Seeds by Rare Dankness Seeds: Harlox is the latest marijuana strain to be released by Colorado-based cannabis breeders, Rare Dankness. Rare Dankness occupy a special place in our hearts their expertise and innovation with premium cannabis genetics has produced some frankly, insane strains in the last few years which have been universally acclaimed by connoisseurs and fellow breeders. 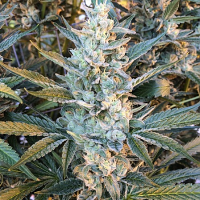 Harlox is derived from the Harlequin strain with its amazingly complex pedigree and high resin production qualities, crossed with The Ox - a high CBD strain with a Bubba Kush dominant lineage. When grown out in a legal climate, the resulting plants are bushy and short in stature. Harlox positively oozes resin. The buds and surrounding leaves are coated in thick, sticky trichomes; this strain would be perfect for those looking to produce concentrates and extracts. Aromas and flavours are a delightful blend of the two parent strains: expect dark berry flavours, backed with notes of coffee and hash. Medical patients in legal climates report a very Indica-dominant high which stimulates appetite and aids relaxation due to the high levels of CBD.